This loop will take you through British Columbia, Alberta and Montana. Wildlife is everywhere. Postcard scenes from every window. Hop out of your car, gain a viewpoint that hangs over an unblemished emerald lake, settle into a 100 year old lodge and bask in the magic of the mountains. This is 'out there' exploration at its best. If you are a U.S. visitor travelling from the south, begin your tour in Columbia Falls. This pretty village has a wide array of parks and natural spaces to enjoy such as the River's Edge Park on the banks of the Flathead River. The Columbia Falls Market is one of the most popular in the valley. Columbia Falls to Whitefish is 9 km / 5 mi. Whitefish offers a quaint downtown with boutique shopping. Explore the Whitefish Trail, moments from town. If you are a railroad buff, you'll love the historic Great Northern Railway Depot. It's the busiest Amtrak stop between Seattle and Minneapolis. The depot doubles as Whitefish Museum. Eureka, located in the Tobacco River Valley, offers wonderful walks by the river. Stop for a delicious old-time milkshake at Cafe Jax. Canada / US border to Fernie is 68 km / 42 mi. Once in Canada, drive through Ktunaxa Nation Tobacco Plains Reserve. You'll also cross the Elk River as it spills into Lake Koocanusa. Continue northeast on Highway #3. Fernie is fully encircled by the majestic Rocky Mountains, making it a bucket-list location for adventurers and sightseers. 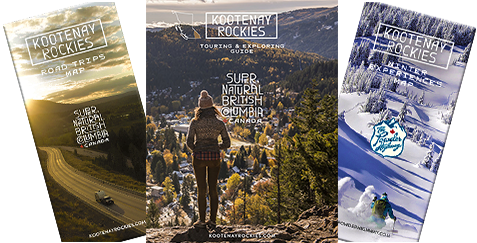 World-class fly-fishing, thrilling whitewater rafting and a hiking and biking trail network complement its eclectic arts community. Fernie hosts many mountain biking events during the summer and fall. The Fernie Museum offers scheduled heritage tours of the downtown's brick and stone architecture. Sparwood is a short drive north on Highway #3. During the summer, educational and fun tours of Teck's Elkview coal mine depart three times per week. Just beyond this alpine community exists a treasure trove of adventure. Highway #3, Sparwood to Pincher Creek is 81 km / 50 mi. Crowsnest Provincial Park (day-use) was a First Nations camp site. The area's mining heritage continues to be evident as you drive east across the Crowsnest Pass. Once in Alberta, it's 62 km / 38 mi to Pincher Creek. From Pincher Creek take Highway #6 south to Waterton (50 km / 31 mi). Waterton village is in the heart of Waterton National Park. It's a vibrant centre offering activities, lodging and dining. The park is all about beauty and adventure. Discover its lakes, hikes, boat cruise, wildlife, heritage and culture. Waterton to Babb, south on Highway #17 and #89 is 51 km / 32 mi. Note: Chief Mountain border crossing is closed Oct to mid-May. Waterton to Babb, via Cardston Highway #5 and #89 is 87 km / 54 mi. The Going-to-the-Sun Road is a spectacular 85 km / 53 mi paved two-lane highway that bisects Glacier National Park east and west. It spans the width of the park, crossing the Continental Divide at 2,000 m (6,646 ft) high Logan Pass. Scenic viewpoints line the road. It's worth travelling the road in each direction as the views are equally stunning. Season of operation for Going-to-the-Sun Road is mid-June to early-fall. Vehicle size restrictions apply. Cycling this road before and after it is closed to vehicles is popular. The route along the perimeter of the park on Highway #2 through East and West Glacier Park is also a great way back to Columbia Falls. Halfway between these towns is Essex, known for its Goat Lick Overlook, where mountain goats come to lick the mineral-laden cliffs and Izaak Walton Inn, a popular destination for train buffs. River rafting adventures on the Elk. Listen to: Fernie's Legend of 1887.